Having an artistic nature, one of my main interests in Islamic culture has been its proclivity for creativity. This is true in writing, design, textiles, fashion, architecture, and a host of other avenues. Indeed, my first really positive encounter with Islam came when I watched the cinematically stunning film, The Message, starring Anthony Quinn, which managed to tell the story of Muhammad without ever showing his face. This was in keeping with the tradition that was held in much of the Muslim world that forbade creating images of God or the prophets, and generally viewed creating images of human beings, animals, and Creation in general to be exclusively the domain of the Divine. However, this in no way discouraged the flourishing of the arts, for it gave rise to a culture deeply invested in the creation of design. This art form interconnected with a deep understanding of the symmetry of mathematics, a study which Islamic scholars expanded by leaps and bounds. As one who admittedly loathed algebra in school, I found it fascinating to discover that these scholars found a mystical side in mathematics, considering it to be proof of the order in the world and by extension, the divine order of God. Hence, all designs reflecting this order become a testament to the nature of the Creator, who brought order out of chaos. 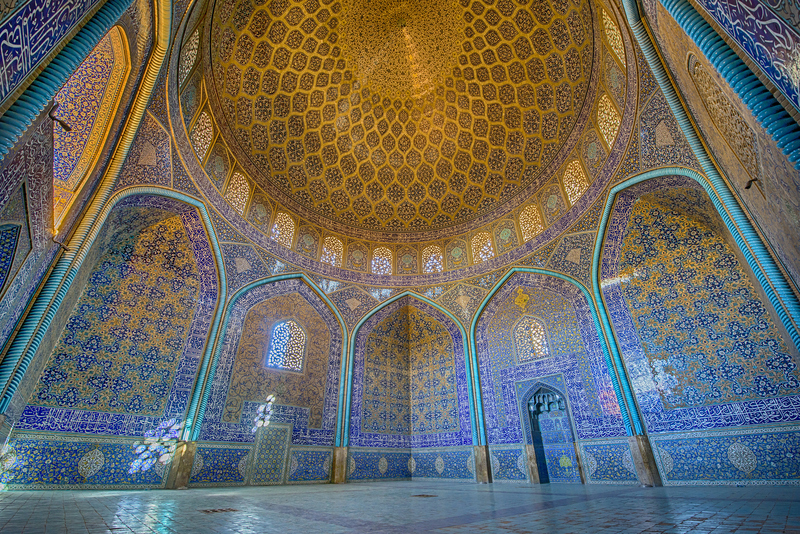 A stunning example of this is found in the blue mosque of Iran, which utilizes a combination of colors, design, and light to create a kaleidoscope effect and gives the viewer an exuberantly majestic glimpse of the eternal. As a Catholic whose father ran a religious antiques business, I personally do not see Christian and Islamic art as being opposed, but rather complementary. I can equally appreciate the different styles and perspectives, one which emphasizes the concept of “sub-creating” by replicating life as it is seen around us, and the other which magnifies the inner workings of life through the ordered patterns of design. Interestingly, I see both these styles as reflective of a deeper commonality, which is an interaction between humanity and the Divine, and the ways in which our world can reflect the world beyond. Catholics would express this as “sacramental imagination”, as belief that grace is imparted through objects and elements of matter, the crux of which is found in Christological theology in which God is believed to have taken up the form and nature of a man in order to die for the sins of the humanity. Islam, I think, would express this interaction between God and Man as a striving for “excellence”, encompassing all that is worthwhile in learning, art, science, and achievement in any human field as flowing back to and reflecting the glory of God. Like both Christians and Jews, Muslims live out their faith through ceremony, from fasting to feasting to pilgrimages and spiritual exercises that emphasize the concept of the journey. On that note, another form of art, Arabic chant, is said to have had its origins as a means of calming herd animals on long caravan treks across desert plains. This traditional style of singing was later incorporated into Islam and became a stable of religious life via the Call to Prayer and Quranic recitation, yet still retaining the mystical quality surrounding a spiritual pilgrimage. As a Catholic, I can relate to the nature of chant as a form of inward journey in the form of Gregorian Chant in the Latin Rite and the chanted recitation of the Gospel at mass favored by the Byzantine Rites. Artistry is a journey that highlights the miracle of life. This is also made manifest through writing. Arabic calligraphy itself has a visual aestheticism that hearkens back to the idea of interconnectedness joining God and Man through the art of design. Deeper than appearance, Islamic literature is shot through with a fine sense of detail and delicacy, and for me, the works of Rumi particularly capture this. He manages to evoke both simplicity and depth in his “search” for love, enlightenment, and union with the Divine. This is not dissimilar to the works of St. John of the Cross, St. Francis of Assisi, Thomas Merton, and other mystics of the Christian tradition. Indeed, the more I read of mystics from across the religious spectrum, from Muslim to Christian to Jewish to Buddhist to Celtic Pagan to Native American and beyond, the more I find a certain common search for the Divine presence and invigorated calling to embrace our journeys towards discovery and excellence. A striking example of the crossover of Christian and Muslim mysticism is in the writings of Khalil Gibran. A native of Lebanon, Gibran was raised as an Easter Rite Christian, but drew heavily from Islamic texts and sensibilities in the writing of his poetry, particularly his epic work “The Prophet”. He also infused his style with elements of the Ba’hai faith, which had a heavy emphasis on conveying religious concepts through poetry. The combination is nothing short of exquisite. Needless to say, on a much more basic literary level, the Bible and Quran have much in common as literary retellings of ancient stories from the same section of the world. They both are fluent in conveying the tenets of religious ethics, law, and foundation sagas through poetic language that begs quotation. This tradition of memorization and oral recitation is an art form which is shared by all “People of the Book”, making the written word vital to the worship of Christians, Muslims, and Jews alike. Finally, I would like to touch upon the subject of dress in Islam, and the art of modesty. This is something I find to be important in both Muslim and Catholic comportment, often manifested in a variety of ways, but bearing the same heart. The idea that fashion is a reflection of interior comportment is something that many find to be a source of empowerment and dignity, and in the realm of fashion, creative Muslim designers have excelled at making the hijab fashionable, and indeed, majestic, through use of materials, colors, and designs. In all these artistic achievements, I have felt myself finding understanding and common ground with Islamic culture and spiritual expression that I believe leads one to contemplate transcendence and the presence of the Divine in our world. It also serves as a reminder that the urge to weave our tapestries of storytelling: visually, vocally, or otherwise, is the great crossroads of the human experience and unites us all as one.